The Kerala Public Service Commission (KPSC), one of the largest recruiting authority in India has introduced the 'One Time Registration' facility initiated in January 2012 which successfully completed 2 years after its launch. So according to this facility, once you register through the system, candidates can apply for new job posts without any hesitation. This one time registration process will allow an applicant to register their details online which can be used for all future job applications. This single window system implemented as a part of the E-Governance in Kerala PSC has already been a blessing to many who has wide dreams of entering into government jobs. It also helps the candidates to apply for any post according to their qualifications. Before applying for a post with Kerala PSC, candidates need to register their profile using the one time registration system at once. After the registration, a user ID and password would be generated which can be used for logging in, apply for a post, downloading the hall ticket and also to view the examination result. After the successful submission of the application for any post, you can find the status in the profile as 'Applied'. The profile can be updated anytime while additional qualification acquired in future can also be added. The one time registration system Thulasi 1.0, designed and developed by the Kerala PSC has already been well received for its accuracy. How to Register in PSC one time registration? Even though a brief description has been given about the process of One Time Registration, more detailed information will help you to know the process. 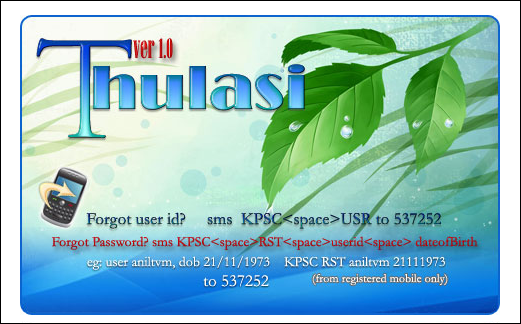 As soon as you enter the official website of Kerala PSC www.keralapsc.gov.in, click the link 'One time Registration' on the top of the home page to enter into One Time Registration page of Thulasi which will lead to the web link http://thulasi.keralapsc.gov.in/thulasi/. Click on new registration or sign up button to start the one time Registration process. The upload a recent photography with size 30kb taken in a format of JPG should be uploaded. The name of the candidate and date of photo taken should be mentioned at the bottom part of the photograph. The scanned image of the signature should also be used in the procedure. Basic information like personal details of the candidate like name, date of birth, gender, religion, caste, sub caste, father's name, mother's name, guardian's name, spouse's name, identification mark, nationality, native state, native district, native taluk, local body type (panchayat/municipality/corporation), local body should be filled with accuracy. In the later steps permanent address, communication address etc with district, thaluk, village details should be entered. In the next step, your Email Address and Mobile Number should be filled with due care. As the user name and password details are send to the mobile number and mail ID, the details should be accurate. As soon as you finish the procedure, an SMS with user ID and other details will reach in your mobile phone. The User ID and Password of the Kerala PSC One Time Registration should be kept in secret and can be used for future reference.